Blade varnish without any harmful volatile organic solvents, according to the new ITTF regulations. Convenient use via sponge applicator.FREE SEAL ideally prepares the blade for the later use of FREE GLUE FREE STICKER. 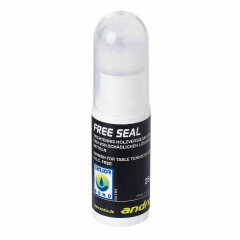 Baseprice: 31,80 Euro / 100 g "
andro Free Seal 25 g is beeing added to cart.